Background: Adverse Childhood Experiences (ACEs), which include traumatic injury, are associated with poor health outcomes in later life, yet the biological mechanisms mediating this association are unknown. Neurocircuitry, immune system and hormone regulation differ from normal in adults reporting ACEs. These systems could be affected by epigenetic changes, including methylation of cytosine (5mC) in genomic DNA, activated by ACEs. Since 5mC levels influence gene expression and can be long-lasting, altered 5mC status at specific sites or throughout the genome is hypothesized to influence mental and physical outcomes after ACE(s). Human and animal studies support this, with animal models allowing experiments for attributing causality. Here we provide a lengthy introduction and background on 5mC and the impact of early life adversity. Objective: Next we address the issue of a mixture of cell types in saliva, the most accessible biospecimen for 5mC analysis. Typical human bio-specimens for 5mC analysis include saliva or buccal swabs, whole blood or types of blood cells, tumors and post-mortem brain. In children saliva is the most accessible biospecimen, but contains a mixture of keratinocytes and white blood cells, as do buccal swabs. Even in saliva from the same individual at different time points, cell composition may differ widely. Similar issues affect analysis in blood, where nucleated cells represent a wide array of white blood cell types. Unless variations in ratios of these cells between each sample are included in the analysis, results can be unreliable. Methods: Several different biochemical assays are available to test for site-specific methylation levels genome- wide, each producing different information, with high-density arrays being the easiest to use, and bisulfite whole genome sequencing the most comprehensive. We compare results from different assays and use high-throughput computational processing to deconvolve cell composition in saliva samples. Results: Here we present examples demonstrating the critical importance of determining the relative contribution of blood cells versus keratinocytes to the 5mC profile found in saliva. We further describe a strategy to perform a reference-based computational correction for cell composition, and therefore to identify differential methylation patterns due to experience, or for the diagnosis of phenotypes that correlate between traits, such as hormone levels, trauma status and various mental health outcomes. 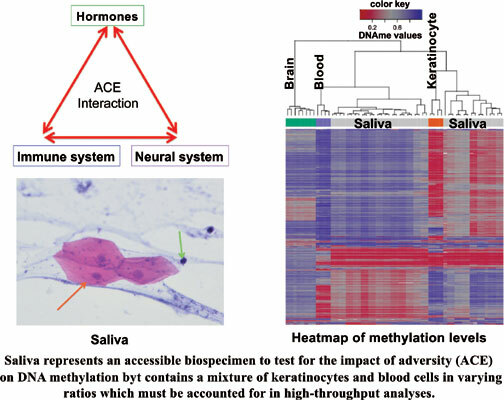 Conclusion: Specific sites that respond to adversity with altered methylation levels in either blood cells, keratinocytes or both can be identified by this rigorous approach, which will then be useful as diagnostic biomarkers and therapeutic targets. Keywords: Adverse Childhood Experience (ACE), Illumina methylation BeadChip array, Methyl-binding pull-down, Bisulfite sequencing, Saliva cell composition, DNA methylation, Pediatric trauma. Keywords:Adverse Childhood Experience (ACE), Illumina methylation BeadChip array, Methyl-binding pull-down, Bisulfite sequencing, Saliva cell composition, DNA methylation, Pediatric trauma. Abstract:Background: Adverse Childhood Experiences (ACEs), which include traumatic injury, are associated with poor health outcomes in later life, yet the biological mechanisms mediating this association are unknown. Neurocircuitry, immune system and hormone regulation differ from normal in adults reporting ACEs. These systems could be affected by epigenetic changes, including methylation of cytosine (5mC) in genomic DNA, activated by ACEs. Since 5mC levels influence gene expression and can be long-lasting, altered 5mC status at specific sites or throughout the genome is hypothesized to influence mental and physical outcomes after ACE(s). Human and animal studies support this, with animal models allowing experiments for attributing causality. Here we provide a lengthy introduction and background on 5mC and the impact of early life adversity.